Finally.. they are here!!! 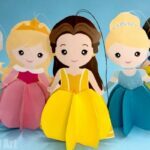 Our set of Disney Princess Ornaments are COMING!!! 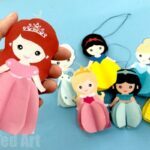 After your enthusiasm for our Mickey Mouse Ornaments, we simply had to make a Disney Princess Ornaments series too! To kick things off, we have our first Paper Disney Ornament with our lovely little Paper Snow White Ornament Printable! 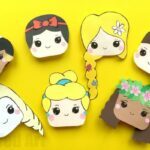 Be sure to follow this website (and sign up to our newsletter below) to get the updates for when all the other princesses are live. I am getting them done as quickly as possible. Be sure to come back for Elsa, Belle, Jasmin, Aurora, Arielle and Cinderella! Such a lovely set! 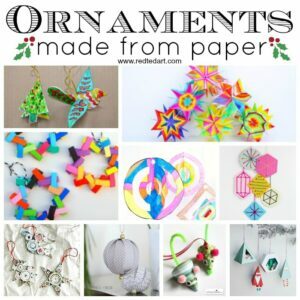 Find more AMAZING Paper Ornament DIYs here! 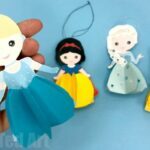 Watch our Snow White Paper Ornament video or followe the step by step written instructions below! Print out your printable and get hold of some yellow paper. 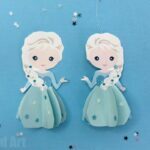 ROUGHLY cut out the two snow whites – keep them CONNECTED, for easier gluing. Fold the paper so that the two snow whites are back to back. Hold against the light to align perfectly. Make a neat crease. 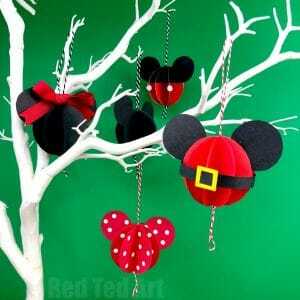 Add glue and the thread for hanging. Glue the two sides together as neatly as possible. 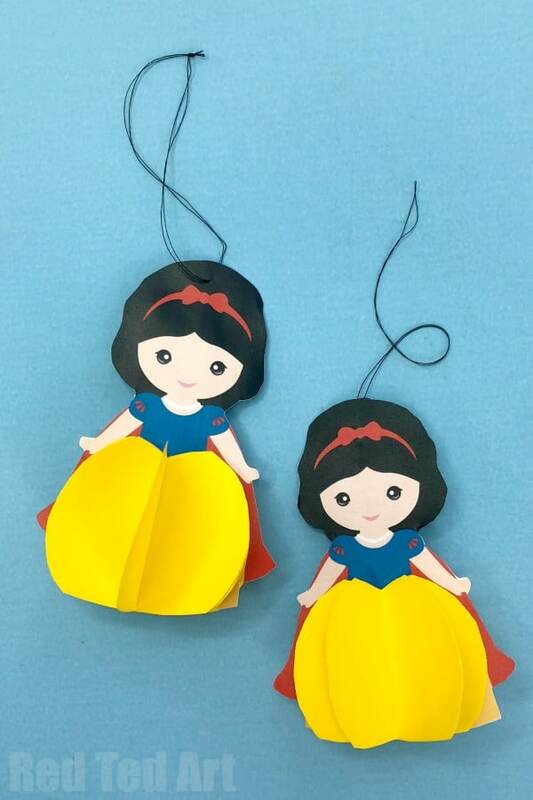 Cut out the Snow White outline as neatly as possible (do not accidentally cut the hanging thread off). Cut out your circle for tracing. Using your circle template, cut out 8 yellow circles. Add glue to one half of one circle and place a second one on top. Glue FOUR circles together. Get the 5th circle and start a “fresh” set of FOUR circles. Take one set of 4 half circles and place on top of your Snow White. Outline the top curve of her dress with a pencil. Trim. Trim the second set of 4 half circles in the same way. Glue down a set of 4 circles in each side of snow white. Trime the borrom of all the circles to align with Snow White’s skirt. 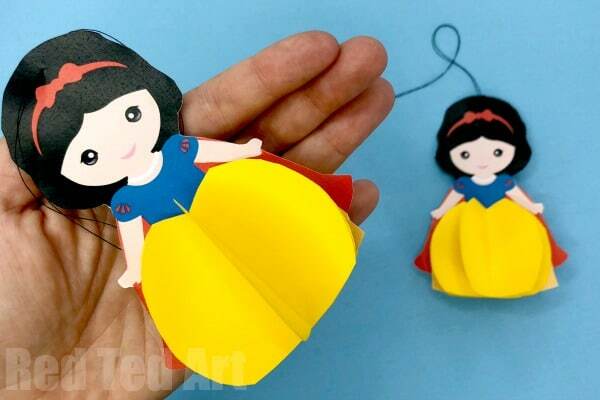 Congratulations, you have made your first Paper Snow White Ornament!! 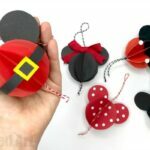 Learn how to make Paper Mickey Mouse Ornaments or use the free printable! My pleasure! We are on Princess Number 5 right now.. enjoy the others too!! I am so excited for these! I would love to know…. 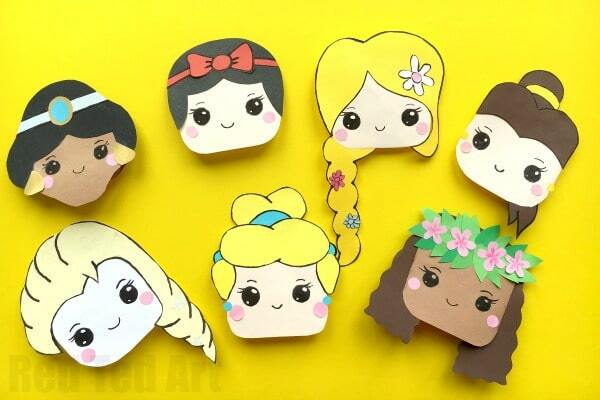 will you be making the rest of the princesses? Moana, Mulan, Pocahantas? Merida? Tiana? I’m keeping my fingers crossed… we would love a complete set over at our house. They are magical. Thank you thank you. Hello Shannon, oh man, I “wish”!!! 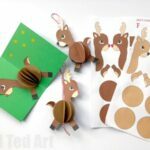 I will add them to the wish list – they were a lot of work and kept me very busy. But hopefully I will be able to add some more. 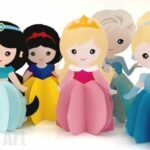 In the meantime, I have two “colour your own” princesses coming, which can be adapted maybe to suit some of the missing princesses?